Being the last day of the trip and not looking forward to a long journey back home to Los Angeles, I woke up early to catch the 6am shuttle bus that picks you up from your hotel, over to Kayseri Airport. It costs TL 25 per person, and takes about just less than an hour to reach the airport 65km away from Göreme. All the shuttle buses leaving Göreme for either Nevşehir airport or Kayseri airport will pick you up from your hotel and match their timings with the departure flight timings. These get generally full almost everyday, so make sure to reserve your seat at least 24 hours in advance (earlier in peak tourist season of June-August). I had timed my departures from Kayseri to Istanbul and out of Turkey in such a way that I have enough time between flights and Pegasus airlines has an 8am flight from Kayseri to Istanbul Sabiha Gökçen airport (domestic), that takes about one hour. And my connection out of Istanbul Atatürk (international & domestic) was at 2pm. This meant that I had enough time to travel from the Asian-side airport (Sabiha Gökçen) of Istanbul over to the European-side airport (Atatürk) and still be able to meet the two-hour-prior-to-departure deadline. If it’s a weekday then the traffic in Istanbul can be treacherous and instead of getting blocked by taking the land route all the way, it’s best to take the following option. On weekends, when the Istanbul road traffic is slow, this will be a better and faster option. This is the most expensive way of traveling between airports, but the easiest and comfortable. Simply take a taxi that takes just over an hour and costs TL 170-200. Since it was a Sunday, I decided to take the option 2. The Havataş shuttle buses are convenient, comfortable and match their timings between buses at Taksim square, so you don’t miss out on time. The shuttle buses run every 15 minutes from Sabiha Gökçen airport to Taksim Square; and every 30 minutes from Taksim square to Atatürk airport. Note: All values in USD, unless otherwise mentioned, are approximate and based on the exchange rate at the time of publishing. Each cost is for one adult. The exchange rate at the time of publishing is assumed to be USD 1 = TRY 1.80. Visiting towns of Çavuşin & Paşabağ, and Kaymaklı underground city. 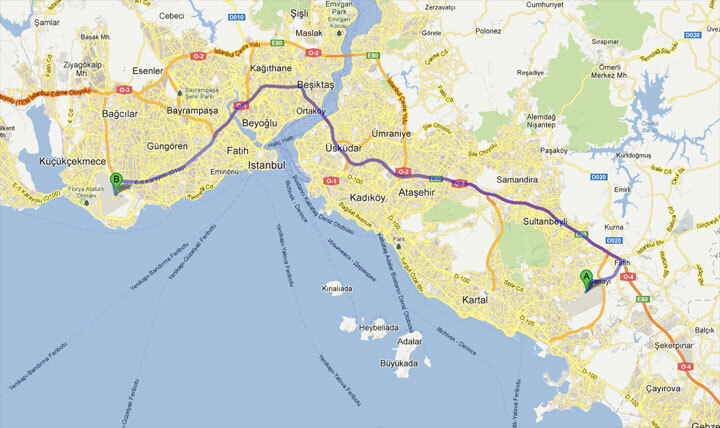 Travel from Göreme to Kayseri & between Istanbul’s domestic to int’l airports. First day in the largest city. Second day in the largest city. Traveling from İzmir to Kuşadası & spending day there. Visiting Efes & towns of Selçuk & Şirince. Traveling from Kuşadası to Bodrum & day there. Traveling from Bodrum to Ölüdeniz & day there. Paragliding in Ölüdeniz & visiting Lycan ruins in Fethiye. Main town of Cappadocia region. Small towns of Uçhisar & Avanos in Cappadocia region. Last day from Göreme to Kayseri & between Istanbul’s domestic to international airports.